Our World is Changing...Shouldn't You? 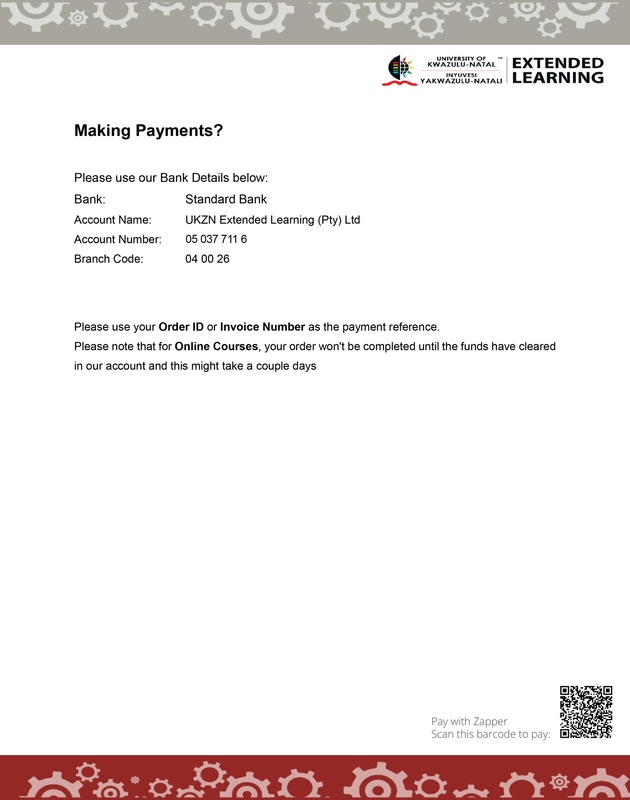 UKZN Extended Learning is committed to enrichment through lifelong learning, by providing high quality credit and non-credit bearing short courses and academic programmes in collaboration with the schools and colleges of the University of KwaZulu-Natal. Registration of UKZN as a provider of education and training courses and programmes. Only private providers of higher education have to formally apply for accreditation as providers. The University of KwaZulu-Natal is accredited as a university by the Department of Higher Education and Training (DHET) and is registered on the SAQA list of Public Higher Education Providers. None of the 25 public universities in South Africa receive/require provider accreditation/registration numbers from the Department of Education or from SAQA. SAQA stopped recording short courses in November 2001. In the case of public universities like UKZN, this responsibility now rests with the institution, provided that there is a quality assurance mechanism in place, controlled and managed by the University. All short courses offered by UKZN Extended Learning are accredited by the University itself, by means of its quality assurance systems and mechanisms that have been approved by the Council on Higher Education (CHE)/HEQC, complying with SAQA regulations. Although short courses are predominantly known for their practical “just in time” and “just enough” approach, various carefully constructed courses are designed to provide mobility through qualifying access or credits into formal degree programmes of the University of KwaZulu-Natal. UKZN Extended Learning is accredited by the Services SETA for a National Certificate in Generic Management. The National Certificate: Generic Management, NQF Level 5 forms part of a learning pathway of management qualifications across various sectors and industries. It is specifically designed to develop management competencies required by learners in any occupation, particularly those who manage first line managers. The qualification builds on the FETC: Generic Management and further develops the key concepts, principles and practices of management that will enable learners to lead, manage, organise and control first line managers and team leaders. The learners will typically be managers who have other junior managers or team leaders reporting to them. In smaller organisations or entities, the managers could primarily be responsible for managing the supervisors and staff within their section, division or business unit. We offer the option of tailor-made courses to suit the specific needs of your company/organisation. Check out our custom courses to see how we’ve worked with companies like the Ethekwini Municipality and Absa Bank toward personalised solutions, and contact us for more information on how we can help you. Click HERE to contact us about a custom course for you.